So far my experience is limited on these boots but I want to share my preliminary impressions with you. 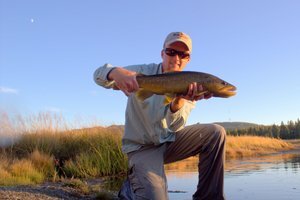 As many people have heard, there is a big push in the fly fishing industry right now to get away from felt soled boots. The main argument being that felt aids in the spread of exotic species like New Zealand Mud Snails and didymo. In their natural environment, these species are not as much of a problem but once they get out of their established ecosystems they can wreak havoc. Of the various companies offering rubber soled wading boots, the only one that I have experienced so far are the Chota boots. Previous to trying them out, I was extremely skeptical having taken more than my share of falls on the stream even when I was using felt. I've waded in sandals that aren't necessarily designed for good traction on wet rocks and had some near disasters. Understandably I was a little nervous about trusting myself to rubber soles on a stream bed covered in water. When I made my last trip to the Smokies, I stopped by Little River Outfitters as is my habit to pick up a couple of items I needed and see what goodies they have started stocking for the new year. After checking a few things out and saying hi to Daniel, he asked what size wading boot I normally wear. It depends and when I told him somewhere between a 10 and an 11, he asked if I wanted to try some new boots. Of course I'm always up for something new so he went and got them for me. After wandering around the shop a little more I finally made my purchases and headed for the stream. Upon arriving, I got my waders on and then pulled on the boots. The first thing I noticed was the Chota Quicklace System and the resulting ease of getting your boots on. When you're in a hurry to fish you tend to notice such things. After putting my rod together, I headed for the water and noticed something else about these boots. Instead of sliding down the bank on my rear end, the rubber soles allowed me to keep my feet under me the whole way down without slipping. This was a nice change and I was beginning to think that the boots might not be so bad after all. After taking a moment to look for insect activity, I finally tied on some flies and the moment of truth arrived. I was nervous to enter the water in these boots but I pretty much had to eventually unless I was going to chicken out. Carefully, leaning on a tree in case I slipped, my feet felt their way along the rocks on the bottom and immediately I was pleasantly surprised. The very first thing I thought was, "It isn't as good as felt but it's definitely not bad at all..." Gaining confidence, I started roaming the stream bottom farther and deeper while noticing that the bottom was slippery on the larger rocks where I normally expect it. Still I hadn't felt particularly unsafe. I fished my way across to the other side that promised a better angle to fish up and another challenge presented itself. When wearing felt, I'm always very careful when transitioning onto dry rocks and even more so when I wear sandals with rubber soles. Normally it's a recipe for disaster. I probed the dry rocks streamside with my toes and then the the whole foot. This was the high point in the rubber sole experiment for the day. The stability and grip was amazing. It felt almost as good as my rock climbing shoes do with no concern at all about slipping even though the bottom of the boots were dripping wet. I left footprints of water but couldn't slip even when I tried to. At this point in the day I was sold on the boots. Later on as I fished some different water I started to change my mind but only a little. While the grip is excellent, it still is not as good as felt on large rocks underwater that are normally the slickest in the stream. As long as I stayed on gravel and smaller rocks where I spread my weight over more than one rock I was okay. When I tried walking on the smooth rocks though I slipped, almost going down once. Despite this, I still think these are great boots. My overall opinion on these boots is that they are a great job and will do a reasonably good job on mountain streams. I think the best application for these as they currently are would be for hiking into to remote smaller streams. They are perfect for hiking in and grip very well on dry rocks. When you fish smaller water you are often on dry rocks along the stream anyway so it is perfect. If you're fishing larger water with a lot of slick rocks (the Hiwassee and Abrams Creek come to mind), I probably can't recommend them as I tried them. The nice thing about these boots though is that they come with studs that you can screw into the sole if you want. Clearly, my experiment in no way gives a good idea of how they would be on our area tailwaters so I don't have an opinion on that yet. If you're looking for a good boot, especially for hike-in fishing or fishing smaller streams where you only get your feet wet part of the time, I highly recommend these as a great alternative to traditional wading boots. Fishing in cold weather can be tough. 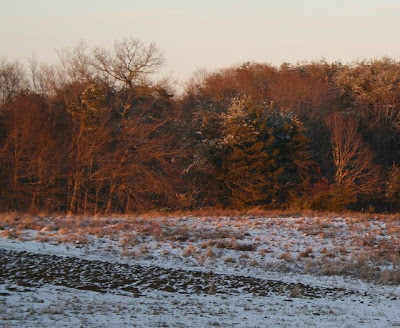 During the winter, even the best fisherman can come away wondering where all the fish were after a day of fishing in the Smoky Mountains. However, with a little careful observation and a change in tactics, the average fisherman should be able to catch at least a few fish on most days of the year. The tips I'm about to share are suggestions that have worked well for me. They are by no means a guarantee that you will catch fish and they aren't even all original. 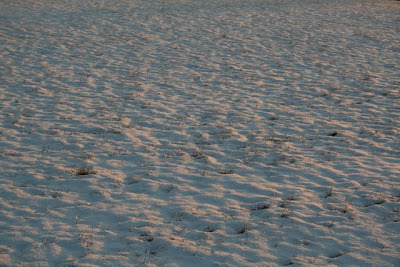 Some are common knowledge to many fly fisherman while others probably contradict generally accepted norms for cold weather fishing. 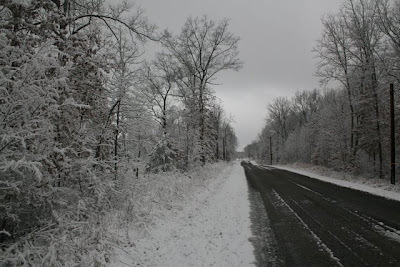 Regardless, I hope that you will find at least one of these tips useful during your next cold weather fishing trip. Tip number one is a classic. 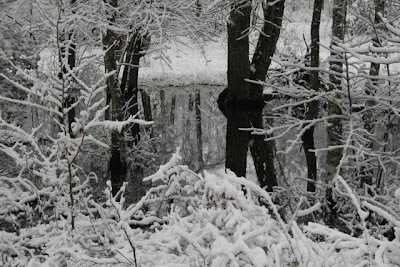 When it is cold out and the fish are sluggish, slow everything down. This may seem obvious and you have probably read it throughout fly fishing literature. Still, I can't stress this point enough and in fact, I still need to be reminded of this wisdom myself on occasion. A good example of the value of this common sense suggestion came during my last trip to the Smokies. For the first hour or so of fishing, I worked my way up Little River somewhere above Metcalf Bottoms. I was carefully covering the water that I expected the fish to be in during cold weather but moving fairly quickly at the same time. My rig was a pair of reliable Smoky Mountain nymph patterns that almost always dredge up a fish or two. After moving only one fish for sure, I decided it might be time for a change of pace. Moving over to Middle Prong, I decided that if the fish weren't hungry, I would at least enjoy my time on the water by fishing a dry fly. In catching 8 fish over the next hour, several lessons were learned, the first of which is the one I already mentioned. Each fish I caught came in slow water were the fly had time to dance and swirl around tantalizingly while the fish below became more and more excited. Eventually one of the residents would just have to come up and sample the apparently juicy morsel I was offering. Some of my drifts were a solid 30 seconds in the same small eddy, the fly floating slowly around and around in a never ending circle. The previous story illustrates several other important points. 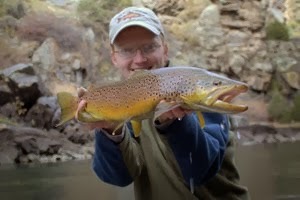 My next tip is counter to generally accepted norms for fishing in the mountains during cold weather. Quite simply, don't be afraid to fish a dry fly. However, if you are going to fish a dry, it is probably more important to match the hatch in cold water. This is where a little observation can go a long way. Midges, BWOs, small caddis, little brown or black stoneflies, all these are likely to be on the water even in cold weather. Once the water temperature rises into the 40's, it is almost guaranteed. Even on the coldest days of the year you can usually find at least a few midges hatching somewhere. 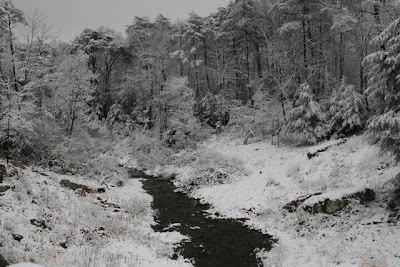 If you decide to fish a dry, you can do two things: Either wait for rising fish while walking the stream or fish likely cold weather holding water. Simply fishing likely water brings us to our next tip. Tip number three is another one you've likely heard before as well. In cold water, fish the slower water. This may or may not mean what it seems at first glance. We often associate fishing in the winter with fishing the pools but fish will be in the pocket water as well. My recent Smokies trip was a great example of this as well. I caught very few fish in true pools. Instead most of the fish came out of pocket water that I normally wouldn't even bother to fish. The fish were in the slowest calmest water in the stream but never far from fast water that would still deliver a supply of food. Once it warms up, I often look for fish right under the current tongues but in cold weather I look in the dead water behind rocks, between current tongues, and yes, in those pools and deeper runs. The fish are almost always sitting out of the main current but ready to make a quick foray out into the faster water if a choice snack floats by. My next tip is one that may or may not always work but seems to for me. 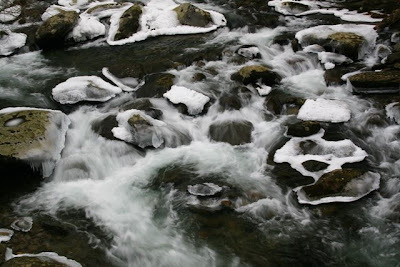 In cold weather, fish the smaller streams. In this type of water, there are not nearly as many places for the fish to go that are hard to fish. On larger water, the fish could just go sit on the bottom in the deepest holes where catching them is going to be tough at best. In small streams they will still be in the pocket water and shallower runs out of necessity. Also, it is a lot easier to cover all likely holding water and figure out which type the fish are in on a smaller stream. Tip number five is a bonus because it is geared towards tailwaters. In sub-freezing weather, look for large midge hatches with lots of cripples on your favorite tailwater. The steady temperatures on a tailwater mean that midges will hatch every day but when it gets really cold, they often have a hard time flying off from the stream. Some of my most memorable days on tailwaters involve very cold air temperatures and trout rising to midges that can't take off. The stranded bugs make an easy target for the fish and the trout will key on the tiny insects. Last week, my buddy David Perry (of Southeastern Fly) contacted me to see if I was interested in floating the Caney with him and another of his fishing buddies, Anthony. Being the addicted fly fisher I am the answer should be obvious. We agreed to meet early Sunday morning so we could put in a full day. We met at the takeout so we could leave my car to do the shuttle later in the day. I was looking forward to the opportunity to really fish some streamers. After arriving at the boat ramp and getting started, it took us a little while to start moving fish but after a while we started boating a few. Moving slowly downriver, we took the time to work each section thoroughly although the bright blue sky overhead left us wondering if our efforts were somewhat futile. The forecast today called for cloudy skies with a slight chance of showers, perfect weather for catching some big fish. Early in the day it didn't look like the forecast was going to verify. Just when I was wondering if it was time to switch over to nymphs and hope for the best, David Perry took his turn fishing while Anthony rowed and proceeded to stick a PIG. Now I know why people are paying him to take them fishing... After a long battle that had me thinking striper, the large brown finally showed itself and we all started getting excited. After some fancy rowing by Anthony and good work on the fly rod by David, we got the nice fish in the boat, got a quick measurement and snapped a couple of pictures. 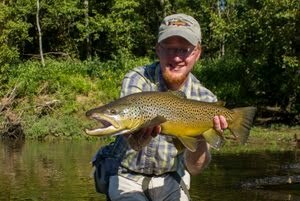 The nice brown measured out at close to 24 inches but if we hadn't of measured it I'd have said it was larger. Another great part about the day was that I got some more experience behind the oars. Probably it would be in my best interest to feign ignorance when it comes to rowing drift boats but someday I hope to own one and its nice to learn on other people's boats in case disaster strikes. Apparently the fish think so. Going fishing on Friday the 13th seems like an invitation for all kinds of bad luck. Expensive rods breaking, monster trout throwing the fly, falling into the ice-cold water of mid February...all these are a distinct possibility when you go fishing on a day traditionally said to bring bad luck. However, my fishing trip yesterday would have made even a cynic believe that there really is no such thing as bad luck. Early in the trip I started wondering if it was a bad choice to fish on such a day. Little River with it's shot at larger browns was calling to me and I started off fishing somewhere between Metcalf Bottoms and Elkmont. After working slowly up a 2oo yard stretch of water with only one missed strike to show for my efforts, I decided to move to a different stretch of water. Again things were slow, although in all honesty it was a very technical stretch. The one fish that I managed to feed picked a most opportune time to eat because my line was tangled around some streamside structure and the hookset failed miserably. After taking a few moments to ponder the fishing thus far, I decided to move to a more intimate setting. 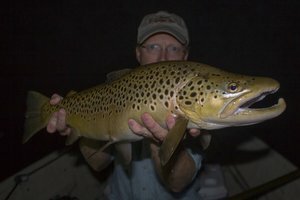 Tremont was the perfect size for the type of fishing I wanted and upon arrival, I decided to go against conventional wisdom and fish a dry. Earlier in the day I had seen plenty of midges and little black stoneflies along with a few small black caddis and early brown stoneflies so a generic #16 parachute Adams seemed appropriate. I moved down to the water and left my thermometer on the stream bottom while I made the first few casts. Picking a slow eddy in a nice deep pocket, I delicately placed my fly in position to dance tantalizingly in the current, spinning lazily around and around. After what seemed like an eternity, I saw a dark form materialize from the depths and lazily inhale the fly. Without thinking I firmly set the hook and was soon admiring the first rainbow of the day. Wondering if it was a fluke, I checked the stream temperature (43.5 degrees Fahrenheit) and quickly moved up to the next likely pocket. This time I missed a strike. In increasing surprise and excitement I moved up to yet another spot and this time caught another trout. In the next hour, I caught a total of 8 rainbows on dry flies proving that fish still have to eat even at cold water temperatures. Later on, after moving to another section it was time to try some nymphs. The fish still fed happily on the Tellico and Brassie I was offering although they didn't hit the fly as hard as they would have if it was warmer out. By the end of the day, I had caught 15 fish which goes to show that there are still fish to catch even in the cold months. One of the amusing things about the fishing trip was the size of the fish. I caught 4-5 fish that were in the 3 inch range. For some reason, at least on this stretch of water, all the smaller fish were out feeding. Maybe they just haven't figured out how to be lazy and conserve energy. I'm really glad I decided to fish the Smokies because it was a great change of pace from the extremely crowded Caney Fork that I've been experiencing lately. While I enjoy catching large fish, it was just as rewarding to be out catching 3-7 inch rainbows as it has been to fish the Caney lately. That said, I'm still excited to get out on the river tomorrow and hopefully will have some good stories by tomorrow evening! Finally! I've got a few days off from work so the next three should provide some fishing time. The Caney Fork is always a possibility because if its close proximity but other streams are probably better options for a good adventure. 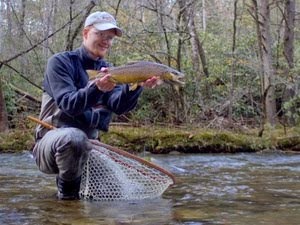 Lately, I have been seeing reports of nice fish being caught in the Smokies including rainbows up to 12 inches or so and also some decent browns. Of course it is a little early for any major hatches to begin but that won't stop me from catching a few. The fish still need to eat and the recent warm spell should have all the fish thinking more about eating than they might normally at this time of year. Also, it is the time of year to start looking for fish making their annual run up out of the lakes to spawn in the streams of the mountains. I've got several streams that I "need" to check on and hope to make a good start on that soon, like tomorrow or Friday. Today was one of the strangest days I've had on the river in awhile. I can't really complain since it was 60 degrees out and its only February 1. Maybe that was part of the problem. Based on what I saw today, I'm getting close to predicting that this is the year that the Caney finally succumbs to the heavy fishing pressure. There were altogether too many people fishing and it was really quite ridiculous. Miraculously I managed to find plenty of space throughout the day. If things continue this bad, I'll probably be fishing other places once the weather warms. Or maybe I'll have to spend more time exploring the lower river. Whatever I do, I don't think I'll be able to spend much more time in the crowds on the upper river. Back to the river being a bit strange today, the fish seemed to have a case of lockjaw until you started stripping or swinging the flies. Even then they seemed to hit at very random times. Early in the day, I got into several fish in quick succession on a stripper midge with a gold bead but after that, I had to work for each fish. Considering all of the high water that we have had lately, it may be that the fish are still adjusting to the ever-changing flow schedule. Still, it would be nice to at least see a few better fish... Since no one has been able to fish the river very thoroughly for awhile, I don't believe that all the fish have been taken out so I'll give it a few weeks before getting too concerned. Then again, several stringers of nice fish were leaving the river today and too much of that will put a hurt on the rainbow population.